Yesterday was a very special day for my Magdalena. Her last soccer game of the season was in the morning, followed by a ceremony where all the players got a medal for their hard work during Spring. As World Cup fans, we came back home and watched the match Brazil vs. Chile. After having lunch and recharging energies, we got ready for her annual recital. She looked beautiful with the high bun and the jazz outfit. She told me to put some make up on her, and couldn’t stop looking herself at the mirror. 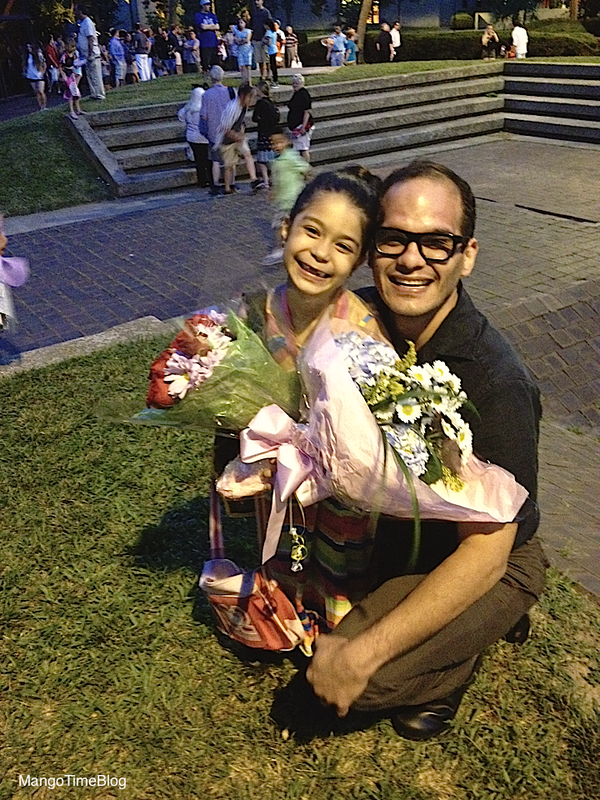 This was her third recital, but it was particularly special. At the end of the show, the academy always gives medals to the kids for completing the course and performing with their heart and soul on stage. There is also a couple of special trophies for dedication and tenure. Magdalena’s class was awarded a prize for showing the most personality on stage. Ro and I could see her bright face from our seats when they announced it. It was a small award but so meaningful for her. When we were walking to the car she said she felt like crying on her way back to the dressing room after the awards ceremony, but she contained the tears. Once in the car, she couldn’t hold them anymore and started crying: “we won, my class won! I can’t believe it”. Crying and smiling, like me when I got the beautiful news that I was carrying twins. It was something completely new for me. It melted my heart to see her so vulnerable and transparent, that she could feel comfortable to express those emotions in front of us. She is six years old, and it was the first time she cried from happiness. I couldn’t help but cry too, looking at her purity of heart, amazed by the most simple things in life. It was not an Oscar, nor a million dollar. It was the recognition of her talents, the incentive to keep dancing and working on her challenges. She didn’t dance for the award. She danced because dancing is her passion. That was just the perfect finale for our fantastic day. Pingback: Sus Primeras Lágrimas de Felicidad | Mango Time !